Vegetable Lasagna: Vegetable lasagna is a pasta dish made from lasagna paste, ricotta or mozzarella cheese (Italians use Parmigiano-Reggiano), tomato sauce and various vegetables and typically flavored with garlic, onion, and oregano. Traditionally lasagna is made from ground meat beef, pork or chicken), but people also like eating the vegetarian version of it. Heat the tomato sauce in a pan, on medium heat. Add in the zucchini, mushrooms, onions and garlic. Cover and cook of 15 minutes. Our paste sauce is ready. Mix the cheeses and chopped tomato in a bowl. 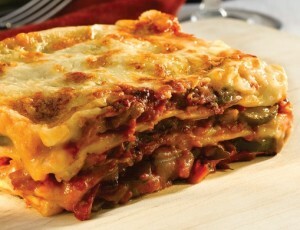 In 8-by 8-inch baking dish, cover the bottom of the pan with lasagna noodles and add a layer of pasta sauce. Top it up with the cheese mixture. Repeat the steps until you run out of the sauce. Your top layer should be noodles sprinkled with sauce and cheese. Cover the baked dish with aluminum foil, making sure to create a dome, or “bubble” with the foil. Do not allow the foil to directly touch the lasagna. Vegetable lasagna is ready to be served. If you have any queries regarding the Vegetable Lasagna recipe, please leave a comment.